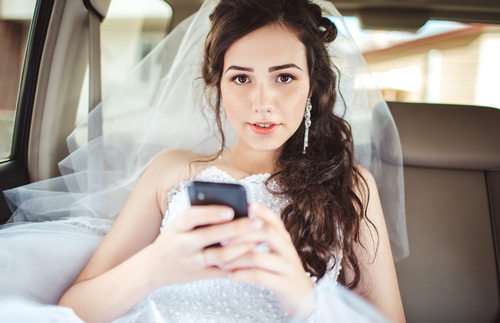 Meet your new bridal jewelry assistant: social media. With so many creative resources online, you’ll be able to find a perfect ring that will be memorable forever. Don’t know where to start? Check out these ideas that will bring the blingspiration your way. Wouldn’t it be great to have your favorite jewellers on hand so you can be alerted of their products and any special deals they’re running as they happen? Well, thanks to social media you can access this just by following your favorite jewellers online. Many have pages and accounts on social media sites such as Facebook and Twitter. By getting this inside information, you stay ahead of the game and can view jewelry ideas from the comfort of your home. Pinterest really should be one of the first places you head for wedding inspiration. Jewellers are using the site to showcase their stunning pieces of art but you can also find loads of wedding inspiration. There are creative ideas for your special day as well as bridal jewelry tips, from how to rock a bohemian vibe to how to look after your precious metals so that they shine long after your big day. You can also browse gorgeous ideas for wedding rings. Bridal Musings offers a Pinterest board filled with jewelry ideas for bridal pieces that make a chic statement. Wedding Ring Bling is another board worth checking out as you can scroll through sumptuous ring designs that tickle your fairytale wedding fancy. The bonus is that once you find a ring you like, you can click on the online store offering the item to get taken to their website directly. Instant bling gratification! Wedding apps can bring you into contact with a community of other brides so you can exchange information and get valuable advice. WedStyle is an app that provides you with tons of wedding inspiration, thousands of images, as well as feedback on your wedding ideas. If you’re not sure about the bling you’re interested in wearing, simply upload an image to the app and let others weigh in on your choice. You might also stumble across some great ideas you hadn’t thought of and the bonus is that you save your favorite photos to personalized boards for easy access later. You can also find interesting jewelry magazine apps to browse at your leisure. Jewelry International is a magazine app that offers a sprawling collection of jewelry from various regions, amazing jewelry designs of the past as well as current breath-taking collections, making it a valuable app for sparking jewelry ideas. You can also crop images you love and share them with friends on social networks. This is another site where you can find bold and beautiful jewelry images. One of the must-follow accounts is @howheasked. Although the account is focused on marriage proposal stories, there are also pictures showing people’s engagement rings so you can see pretty pieces that will give you some great ideas. Another idea is to follow all the top jewelry designer accounts for some in-depth inspiration. You’ll get to view interesting materials designers use in their jewelry creations, view their spellbounding pieces, and scroll through lots of beautiful images to inspire your own wedding jewelry designs. Sometimes checking out what celebrities did with their bridal jewelry can help to give you some great ideas. Just search for celebrity weddings on Google – there are loads of articles and slideshows that come up instantly, revealing all the celebrity jewelry trends that can take your wedding from pretty to pretty amazing. Although you want to showcase your personal style as much as possible when choosing jewelry such as engagement rings or wedding anniversary rings, knowing the latest celebrity jewelry trends can help you gauge designs you like. Of course, there’s a Pinterest board for everything, including one on celebrity engagement rings that is worth checking out. Whether you’re planning your wedding or searching for the perfect wedding anniversary rings, log onto the above sites and find valuable ideas to inspire your inner jewelry designer. May 8, 2015 in Anniversary Rings.